Home » Award Bookings » Reader Help Needed: Haneda to Gimpo or Narita to Incheon? Reader Help Needed: Haneda to Gimpo or Narita to Incheon? If all goes according to plan, I will be traveling to Japan and South Korea next month. It will be my first time in both countries and I am working now to finalize my flights between Tokyo and Seoul using miles. The return flight is set, since I need to fly into Narita to connect with my United Airlines flight to Honolulu, but I’ve got three options on the outbound, one on Asiana Airlines, one on All Nippon Airways, and one on United. I am leaning toward booking economy class tickets because of the short flight duration. My cursory research indicated that Haneda and Gimpo are much more convenient airports and therefore the obvious choice would be on Asiana. Drawbacks to this option are the late departure and the fact that I will also be flying Asiana on the return trip and would like to give either United or ANA a try. The ANA option appeals to me because I have never flown ANA (yet) and have heard great things about their service. The United option appeals to me because I have never flown on UA intra-Asia, would like to sample one of UA’s Asia-based flight crews, and I hear that elites are often upgraded on this route (though I really am not concerned about that). Business class is only an extra 7.5K miles each way. Is it worth the upgrade? 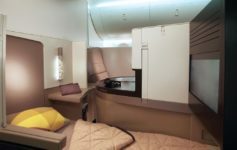 Award space is available in business on all three carriers, but again–15K miles is 15K miles toward my next international first class award. Now based in Germany, I am not exactly swimming in United miles anymore. I could always use British Midland miles, but at 30K r/t for economy class + the fuel surcharge, I think I am better off sticking with UA miles. I look forward to exploring this region of the world and becoming an expert myself, but for now your sage advice is appreciated. OZ has pretty good service I flew them ICN – PVG as well as HGH – ICN both flights were pretty empty in the premium cabins. ICN – PVG was only me and one other PAX in C with 3 FA’s! It was awesome. They definitely got me hammered on that short flight! Have yet to fly NH in premium cabins but I am sure they wouldn’t be bad servicewise. OZ had the gorgeous FA’s 🙂 Can’t remember what the NH FA’s on my one flight looked like in Y which probably means nothing spectacular. I’ve experienced UA’s Asia-based flight attendants to/from HKG-SIN and they were outstanding. That said, I would vote for Asiana from Haneda to Gimpo just to get a couple of new airports under your belt. Save ANA for a longer-haul redemption starting in Frankfurt or the USA. And if you’re anything like me, you’ll regret not burning 7.5k more miles to fly business. Yes, it’s not a long flight per se, but might as well keep your standards up! 7.5K miles is sooo easy to re-accrue! Have a great trip! Any time you can reduce travel time in Tokyo and Seoul, you do it. Don’t make your choice based on the flight product in economy, none will be special worth trying. Go for United only if you care about the handful of miles towards lifetime elite status. Otherwise go for an Asian carrier. Love the Asiana service, love the Asiana food. I do like ANA but their regional product doesn’t impress me. I’d make the decision on flight time with an edge towards the close-in airports if possible. I would try Gumpo amnd Haneda simply to try different airports. As Gary said, I wouldn’t worry too much about the airline product since the flight is short, especially if you are in coach. Intra-Asia on United is certainly nothing special, so I would give Asiana business class a try. With the new rail service to Incheon you can be in the center of the city in 30 minutes. The non-express service is more often (every 6-8 minutes?) and 1/3 the price. The express leaves every 30 minutes. No need to wait. Depending where you need to be in the City the local train connects with one of the subway lies before reaching Seoul Station. Unlike Tokyo the location of the airports in Seoul isn’t a big deal. I think I would suggest the Gimpo to Haneda flight mostly for convenience and more affordable transfers to maximize your time in Tokyo (and Seoul). Service is pretty minimal on these short flights, and as others have said ANA regional service is nothing special. Just as a minor data point, I got a free upgrade ICN-NRT on a United 777 back when I was a newly minted 1P. Listen, I’m going to go out on a limb here – but dump the flying alltogether. It’s your first visit to both countries, so travel in a way which allows you to see a bit more of them. My personal recommendation (having done this with friends), is to take the Shinkansen down to Hakata, ferry across to Busan, and then the KTX up to Seoul. Green car tickets are worth the value, and when you spend so much of a trip having to travel by air you’ll appreciate the leg room and different mode of transport. Yes, I know saying this is herracy but you’ll get over it, and thank me for the relaxing views of luscious countryside from the comfort of a smooth train journey and a seat which puts some J cabins to shame. @Michael H: That’s an interesting thought (and not heresy at all). I will look into it before I book my ticket to Seoul. I don’t think I have enough time for it, though. I would definitely give OZ a try. I loved flying from Gimpo to Haneda. ICN / NRT on UA in Coach gives you the opportunity to hear endless advertisements for Economy Plus. Service on NH between the two cities will be excellent, but make sure you don’t take the NH 908 flight in economy. It has no personal TV’s, and is essentially a charter aircraft and the longest two hours in the air on any flight. It’s full of tourists going either way, or locals returning home after vacations. If you can upgrade from either locale, go for it. The worst service I’ve received in my 20 times through Asia, was on a UA flight last year. NH’s service is usually very good.